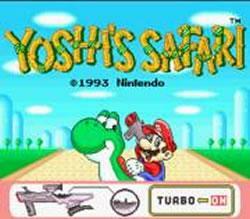 Yoshi's Safari was the only Mario game to feature Nintendo Scope Compatibility. Bowser and his army have taken over Jewellery land and imprisoned its rulers King Fret and Prince Pine... not only that, but they've stolen the twelve gems which keep Jewellery land stable - shortly after these gems were stolen the land was torn into two by a powerful earthquake and split into two zones Light Realm and Dark Realm. So what're you waiting for? Hop onto Yoshi, grab the Nintendo Scope given to you by Princess Peach and set off on a journey to get those gems back. Blast enemies with your Nintendo scope until they surrender the gems to you. Using Nintendo's Mode 7 technology which can recognise exactly where the scope is pointing, bringing an extra dimension to the way the game is controlled and played. Bring a friend and two players can join forces and one can control Yoshi while the other blasts away at the enemies.